I love living in San Diego. The sunshine, ocean breeze, and the year-round coastal weather make it one of the best place to live in the continental US. However, one thing that I missed the most about living in the Midwest was the green trees in the summer. So my roommate Pop, my cousin Pat and I decided to go to a place that combine the beauty of the Pacific coast with the greenery of the Midwestern states for the Fourth of July weekend. That place was Oregon. You can click on the panoramic images to see the larger version of the photo in the lightbox and on the maps for information and direction on the various places we visited. Among the things that you can find around Portland are: food trucks, donut shops with long lines, fixed-gear bike, and of course, "hipsters". Food trucks can be found all over Portland; A favorite place to hang out for hipsters and tourists alike. The famous Nong's Kao Mun Gai food truck. Unfortunately they were closed for the day but fortunately that they have a sit-down restaurant to the south of the city. Beautiful street mural by Faith42 on Southwest Washington Street. We took an evening stroll like this local couple at the Portland Japanese Garden in Washington Park. Per the recommendation of our lovely Airbnb hosts, we had breakfast at the Waffle Window on Hawthorne Boulevard. 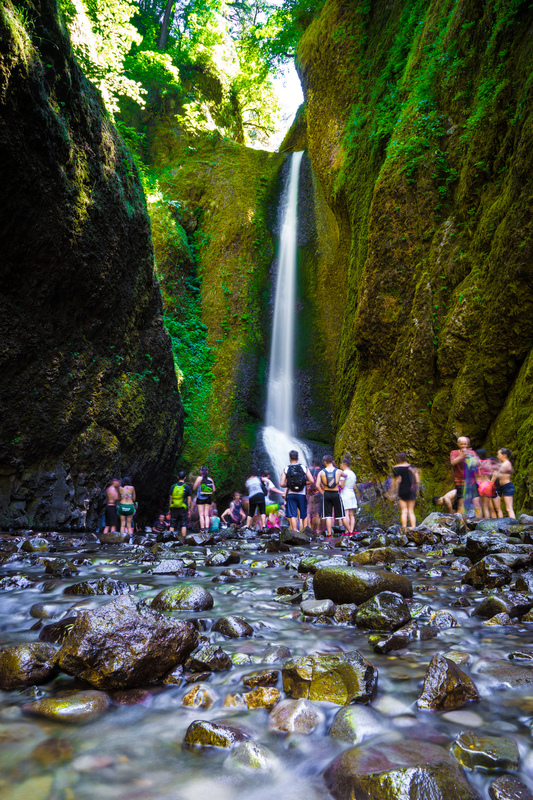 Our destination of the day was the Columbia River Gorge National Scenic Area located one hour east of Portland. Along its 80 miles length are many waterfalls, hiking trails, and a windsurf town with brewpubs. We originally thought the day would just be an easy-going, drive-and-sight-seeing kind of day but ended up hiking through treacherous trails to see waterfalls. Actually, the trails were not that difficult, we were just not at all prepared for them! Multnomah Falls is the tallest waterfall in Oregon. The Benson Bridge in the foreground was built in 1914 by a Norwegian-American businessman Simon Benson (Wikipedia). It took about an hour to climb pass a log jam and walk through water chest deep to reach this Oneonta Falls. Talk about dressing appropriately for hiking! After the hike, we go dried off at a local brewery in a windsurfing town Hood River. We continued our journey south pass Mount Hood, the highest point in Oregon, stopping at a few locations to take pictures before looping back to Portland in time for the Fourth of July firework. A view of Mount Hood from the panorama point just outside of Hood River. Mount Hood as seen from Trillium Lake. An absolutely stunning view. A familiar scene of us taking tens of photos of the same scene at the same location. One good thing about traveling with photography-loving people was that we didn't have to wait for each other because we all were taking the photos! Another perk is that you get a great photo of you! It took us about an hour of driving around to find breakfast as there were lines everywhere on Sunday morning. We ended up getting some donuts at Blue Star Donut. Pro tip: go to Hawthorne location, no lines! We took it easy in the morning by sight-seeing and shopping around downtown Portland. Oregon is a shopper haven as there is no sale tax! Two-hour drive to the west is Astoria, a coastal town located at the mouth of the Columbia River. The weather here was surprisingly nice compared to hot summer heat we experienced inland in the past two days. Our first destination was a stationary converted boat, tuna beer-battered fish-and-chip shop called Bowpicker. There was no escape this time as we spent almost two hours in line. It was well worth it the wait though! If you rank the US states by the number of Volkswagen Bus per capita, Oregon would be at the top of the list. The remain of Peter Iredale's rusty bow and masts. The ship was washed ashore in 1908 as it was bound for Portland from Mexico. Thankfully, there were no casualties (Wikipedia). A mandatory group photo with the attraction; like good tourists! One of our goals of the day was to capture images of the sunset along the Oregon coast line. We did some research online and found a lot of beautiful sunset photos of two locations: Wreck of Peter Iredale in Fort Steven State Park and Haystack Rock in Cannon Beach. So these were the stops that we made. We arrived at Haystack Rock right in time for sunset. It was pretty funny that we actually splitted as soon as we walked onto the beach because we were trying to one-up one other on who would get the best photo. I, of course, think I got the best one! If you clicked on the map you will see that the last location on Day 3 itinerary that has no name - a newly-established Pinolo Gelato. Sandro, the owner, serves THE BEST gelato I have ever had. His chocolate gelato is a must have if you visit Portland. This is our first glimpse of the Haystack Rock as we drove pass it. Simply breathtaking. It has been a marathon so far in terms of the number of places we visited and the amount of driving we had to do and the last two days were no exception. We got up early to prepare for a 5-hour drive south from Portland to Crater Lake National Park. Half of the drive was an uneventful drive along Freeway 5 to Eugene, the home city of University of Oregon. The other half was through a series of small one-lane freeways through the beautiful redwoods. The drive was well worth it! The Crater Lake was beautiful. So beautiful in fact that almost all the photos that we took of the lake with turns out really great, even the ones from our camera phones. Crater Lake is so vast that I cannot capture it in a single image because none of my lens were wide enough. The island to the left is called Wizard Island which rises 750 feet above the surface the lake and actually has its own volcanic crater named the Witches Cauldron (Wikipedia). An activity that everyone must do while visiting Crater Lake is to jump into the lake. To do this, you must take a 30-minute hike down to the boat landing where there is a small cliff hanging over the lake. The drop was only about 2 stories high but as you can see in the video, I was all tensed during the jump. Located on the east rim of Crater Lake is the Phantom Ship. It got its name from the fact that it tends to appear and disappear in foggy weather like a ghost ship. Beautiful sunset over the lake. The sky cleared up that night and the Milky Way was visible even through naked eyes. Pop used an app to locate the direction that the Milky Way would appear so we were able to take photos like this one. I will leave you with a short video clip that Pat did for the trip. You can find some of his beautiful videography work on Vimeo.